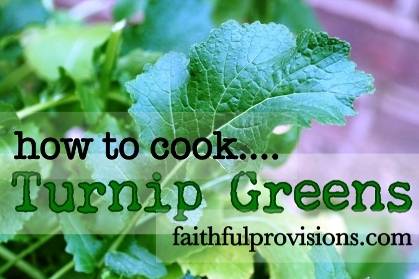 Do you know how to cook turnip greens? For the next several months, they will be in season and on sale. 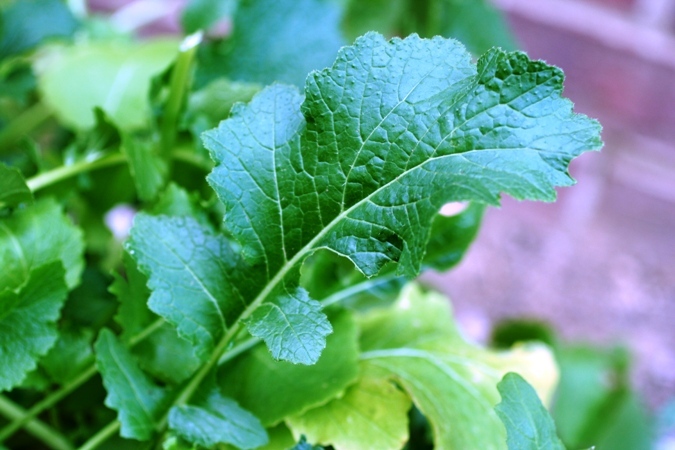 (Turnip Greens are on the list for What to Buy When: March.) I have never been a big fan of turnip greens, because when I was growing up, I always thought they were too bitter. In my family, they were cooked and flavored with vinegar. COOK’S TIP: One of my tricks when cooking with bacon is to remove it from its original packaging in 3-4 strip portions and freeze. Then, while it is still frozen, I cut it into short, bite-sized pieces. This size is perfect for cooking in a dish like Turnip Greens or my favorite, Breakfast Burrito with Spinach and Bacon. It works beautifully and is less messy. Plus, I can easily control the portion size. If you are a greens lover, you could use this recipe with just about any green: collard greens, mustard greens, kale, Swiss chard, and more. I particularly love this type of dish with a crowd at a family gathering or a holiday event. This season, you’ll also like turnip greens with your Easter recipes of ham and Sweet Potato Casserole. I serve this in soup bowls with bread for dipping. This is a very nutrient-dense meal, so don’t let the broth go to waste. All the nutrients from the greens seep into the broth and are great for boosting your immune system. Many people boil greens and use the broth for health purposes. In a medium to large stock pot, cook onions and bacon over medium-high heat, until fully cooked, about 4 minutes. Add stock, greens, and seasoning and bring to a boil. Once boiling, reduce to a simmer for 30-45 minutes. Serve in soup bowls with broth, and bread for dipping. How do you cook your greens? What are your tips and tricks to making them turn out just right? I would love to know, so please share in a comment below. I didn’t like turnip greens much, until I had them at Cracker Barrel. They are the best! I may have to try cooking them. I use Smoked Jowl, which is cheaper than bacon usually, chopped onion, and about a teaspoon or two of Glory Foods Roasted Vegetable Soup Base. The I cook them all day, on med-low heat, in a cast iron stock pot, making sure they stay covered in liquid. My Mama, my husband, and my son say they are the best they’ve ever eaten. Funniest part is…I HATE turnip greens and have NEVER been able to get them down. My husband says, that in all his professional cooking days, he’s never met ANYONE able to cook something so consistently delicious that they themselves have never managed to taste without getting ill, Lol! I use one SMOKED turkey wing. It seasons it perfectly. I may only need a couple of shakes of salt,if any. I use this too with my favorite, collard greens. Turnip greens are best when eaten with the southern staple, cornbread! That “pot likker” is wonderful to the last drop! This recipe was so good. I added white beans and loved it. Do you cover it when simmering or leave uncovered? I cover mine because I like more juice. Thanks for this recipe! Was scouring the web looking for what to do with turnip greens…cooked my down with a tomato-bell pepper-onion-habanero sauce. Perfection! I guess I’m going to be seeing a lot more of t-greens…thanks! You are welcome, so glad you like it. That sauce sounds fabulous!! My kids con’t to grow vegetables as part of their after school project at Edison Johnson Rec Center. They brought home some turnip on yesterday and I was like, what’s that? Well, let me start cooking y’all.